And no I haven't played Lego Star Wars more than once, hehe. Can't believe you caught me! 30-40 lapers are ok if the racing is tight. Edit: I assume you scouted the GTPlanet forums for Aussies, I know there are a few on there. Is it better than Modern Warfare 2? A friend is into it and prefers Modern Warfare 2. Just trying to gold all of the seasonal events. Haven't tried time trial or drift yet, but the races are done. Well worth it, they pay huge amounts of experience points. Yea, ive got gold in all of them. Not to worried about the drift and time trial. Ive had a go but not really a serious crack. Maybe we can organize a night of racing for a few of us. ZEN will join too i sure. jezza is a speed demon. definitely finds a few extra tenths somewhere. Just got GT5 for xmas and it's everything i expected it to be! Classic Gran Turismo, nothing less. One thing I wasn't happy with was some of the dodgy textures on the less important cars...but I guess when you make that many cars you are bound to miss some details here and there. Also are there no specific manufacturer races like in the previous GT's or am I looking in the wrong place? Overall, I'm very happy with the game lol. Yeh no manufacturer races and some dodgy textures. But the essential soul of Gran Turismo is there. It's funny, when this game only got 8/10 and so forth, I have since been going out and buying lots of games that I skipped over because they only got 7.5/10 and similar scores. Some of them are amazing games I've been missing out on. Just finished my second enduro. The Tsukuba 4-hour was soul crushing last night. Hopefully they'll make a patch with dealership races or something because I quite enjoyed that part of the game. I'm encouraged by the seasonal events, so you should have extra races every month. They pay massive EXP as well. So there are going to be new seasonal events every month? No idea, but I imagine that's how it would go. The current ones expire after a fortnight. So if they make a new one every fortnight I guess you'd have at least two a month. If they keep it up. Hmm i doubt they have new 1s every month. Maybe every season. So 4 a year. just got my signature edition :$ freaking excited. anyway anybody knows how to upload the photos to gt5 website? I only know how to upload them by the usb transfer method. any other ways? btw whats your psn nick guys? time for race? I didn't know you could do that, not that it does me much good lol. I am ready to race! Thou I am back at work so my times are in the evenings and on weekends AEST. After racing with Monstar I realised I need to get a Wheel, the Sticks just won't cut the mustard. Monstar (with Steering Wheel) in a full sec. faster then me on most tracks with identical cars. Word on the Forums is that a good wheel can cut down anywhere up to 1-2sec.s per lap. Now I just need to find a spare $500 and convince my wife that the Wheel is not an eye sore in the lounge room. Regardless of me getting that wheel I am still always keen for a good race. esterence a écrit: anyway anybody knows how to upload the photos to gt5 website? GT5 MY HOME page is the easiest way. Set the photos you wish to upload as "share online". you can have up to 8 photos in your photo album as "share online". This is done in game. 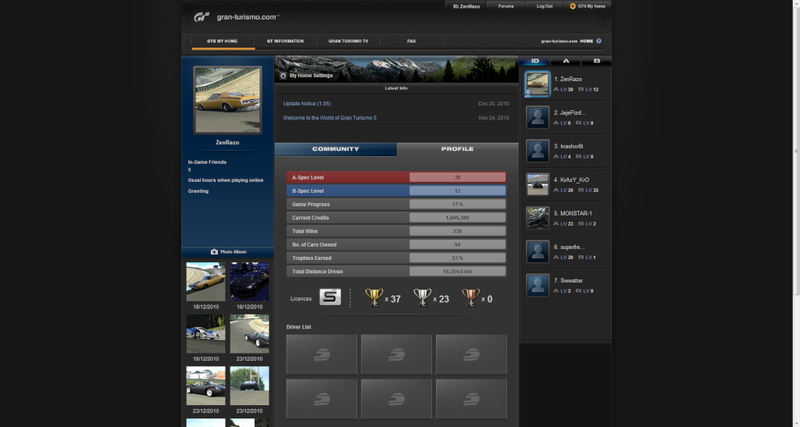 Sign in to gran-turismo.com (on the PC), using your PSN name and Password. Your photo album will be shown on the right side, click on the image you want to upload, click on full screen and simply copy and paste the url. Here is an image of my Toyota Minolta in action on Trial mountain. Here is an image I took with Snagit that shows my GT5 MY HOME page, note the photo album is on the right. yeah mate, thanks for that! added you guys too. But that won't stop me from posting my best time trials! See if you can beat this, use the same car. All of the cars in my time trials are stock unless otherwise noted (with exception of tyres). Also, all the time trials are done without driving aids unless otherwise noted.